What’s your history with the YMCA? I grew up coming to the Y! When I was in elementary school, I attended School Age Care in Eagan. 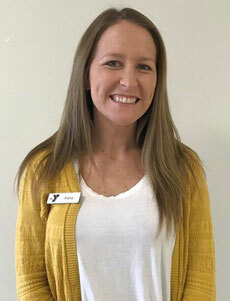 When I was a little older, I volunteered to help with Kids Stuff—where families can drop off kids while they work out at the Y.
I am a graduate of Minnesota State University-Mankato in Elementary Education. I live in Elko with my husband, Ryan, our son, Carson and our yellow lab, Max. We enjoy experiencing new restaurants, plus enjoying the trails and outdoor parks near our home—having all four seasons in Minnesota is the best! What’s the best way for families to connect with you? If you’re interested in having your child attend the Lakeville ECLC, call 651-728-5344 to schedule a visit. You can email me with questions at any time, too.